Back after a three week European trip. Time to wrap up this trip diary and get back to some modeling! 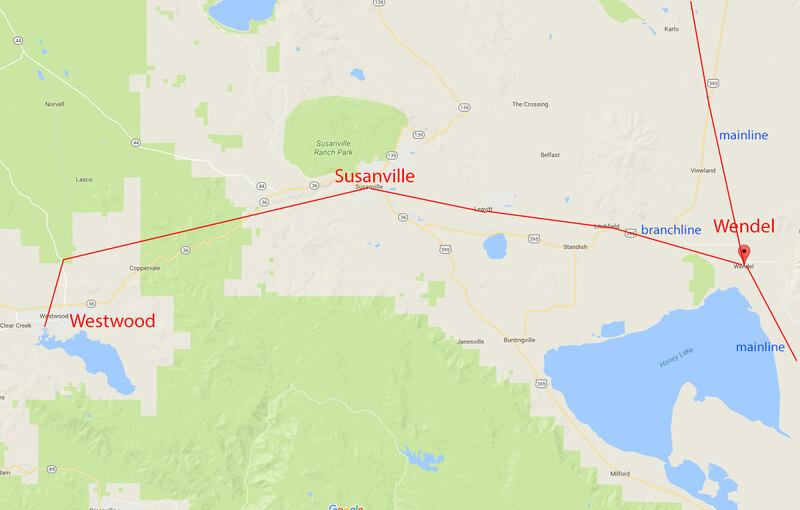 After Wendel I headed west to Susanville and Westwood. By doing this I left the Modoc mainline and was now following the branch line. This branch line was originally built by the Southern Pacific to connect Fernley (and the SP mainline) with the logging areas of the Californian Sierra Nevada. Next stop on the trip was the settlement of Wendel, CA. I drove along the county road from Flanigan to Wendel which meant crossing the Nevada-California border. Until the border the road was gravel surfaced but it abruptly changed to a paved road as soon as I crossed back into California. As such I was able to drive fast between the two locations. The road pretty much follows the Modoc Line all the way to Wendel and I was able to spot it quite easily from the road. The next major destination on this trip was the ghost town of Flanigan. This location was the point that the Modoc crossed the Western Pacific mainline and continued north. In 1963 the Southern Pacific came to an arrangement with its rival to divert Modoc Line trains onto the WP and connect with the SP mainline at Weso (about 151 miles away). 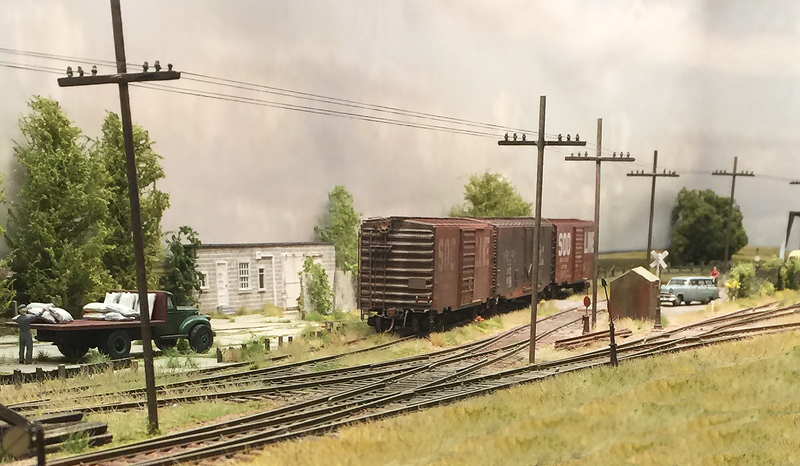 It allowed the SP to abandon the Flanigan to to Fernley section (the section I had just driven alongside) saving 58 miles of maintenance on a little-used line. The Modoc Line heads out of Wadsworth in a north-westerly direction towards Pyramid Lake – about 34 miles in distance. For much of the way the line is visible from highway 447 so I was able to find a few locations to take some photos of the abandoned roadbed. The roadbed itself has been partly paved so it is quite easy to drive on. However being alone and not sure of the tires of my 4 wheel drive I decided to not chance it for this trip and kept to the main road. Smaller roads would leave the main highway and cross the line at various points so I was able to get a good view of the roadbed from these crossing points. At one time Wadsworth was an important town on the railroad hosting company shops, a roundhouse and employing large numbers of people. Then in 1904 the Southern Pacific rerouted the mainline and left the town high and dry. The remaining settlement – it’s not even a town any more – was the first stop on the Modoc Line after leaving Fernley. 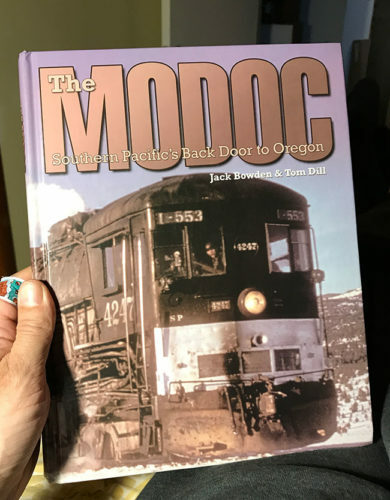 After reading Jack Bowden and Tom Dill’s book on the Modoc Line – a cross-desert railroad that began in the north-western corner of Nevada – I decided to take a couple of days off work to go and trace part of the route.